French designer Patrick Jouin's Bloom Table Lamp opens up right in front of your eyes. Its shade transforms from a closed bud-like position and expands to release more light. Designed by Jouin for MGX, the lamp 3D printed as a single piece, including hinges, and it allows the user to control the amount of light. When closed, the lamp emits a soft glow perfect for accent lighting. Patrick Jouin‘s Bloom Table Lamp is inspired by MGX’s One_Shot.MGX stool and the way plants respond to their environment. 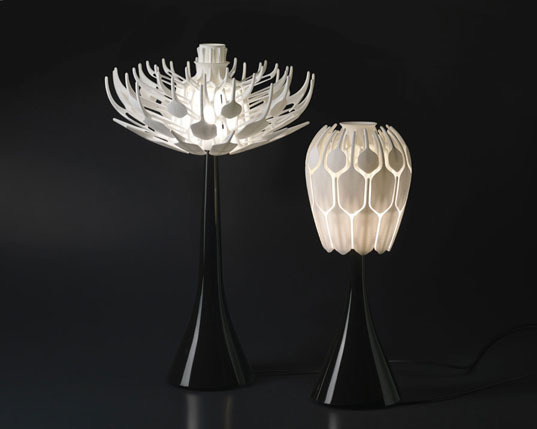 The digital technology behind the lamp design involves rapid prototyping and 3D manufacturing. The process starts with converting a CAD file (technical drawing) into a .MGX file, which is then used to print the image as a 3D object. Combining MGX’s state-of-the-art technology with creative input from Patrick Jouin, the award winning Bloom Table Lamp pushes the envelope in product design. Patrick Jouin's Bloom Table Lamp is inspired by MGX’s One_Shot.MGX stool and the way plants respond to their environment. The digital technology behind the lamp design involves rapid prototyping and 3D manufacturing. The process starts with converting a CAD file (technical drawing) into a .MGX file, which is then used to print the image as a 3D object. Combining MGX’s state-of-the-art technology with creative input from Patrick Jouin, the award winning Bloom Table Lamp pushes the envelope in product design. Patrick Jouin's Bloom Table Lamp is inspired by MGX’s One_Shot.MGX stool and the way plants respond to their environment. 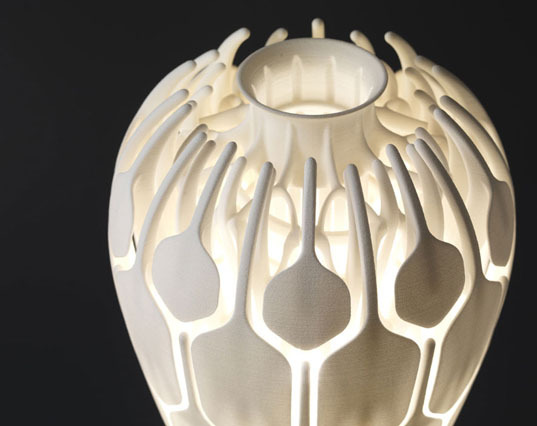 The digital technology behind the lamp design involves rapid prototyping and 3D manufacturing. The process starts with converting a CAD file (technical drawing) into a .MGX file, which is then used to print the image as a 3D object. Combining MGX’s state-of-the-art technology with creative input from Patrick Jouin, the award winning Bloom Table Lamp pushes the envelope in product design.